What Is the Difference Between Great Northern Beans and Pinto Beans? Beans are great way to add protein and fiber to your meals. They're also full of flavor and texture and have a lot of versatility, but you may wonder when to use one bean over the other. The delicate flavor and skin of the great northern bean makes a nice addition to any soup, while the hearty pinto bean may be able to stand alone. 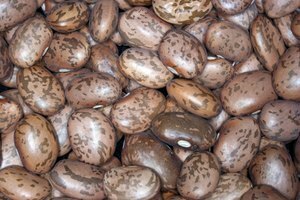 While both beans are oval-shaped and medium-sized, you should be able to easily tell the difference between the great northern and pinto bean by looking at them. The great northern bean is related to the white bean, which is also referred to as haricot, and is white in color. The pinto bean is a pink-mauve color that turns brown when cooked. If time is an issue, great northern beans cook faster than pinto beans, 45 minutes versus 120 minutes. To prepare dry beans, first soak them in water for several hours or overnight, then simmer over low heat on the stove until done. The best way to tell if your beans are done is to taste them, says The World Bean Kitchen: Passport to Flavor. A bean is done when it's creamy throughout. Salt your beans after they're cooked to prevent them from becoming too tough. If you don't have time to prepare your great northern or pinto beans, canned varieties can be used. If you can't find low sodium versions in a can, rinse them in cold water to help reduce sodium content. Store your cooked beans in a covered container in the refrigerator, and discard after a week. How Long Do You Soak Navy Beans? What Is the Difference Between Navy & Great Northern Beans?